Machu Picchu is quite magnificent to see from above. The ruins of Machu Picchu. 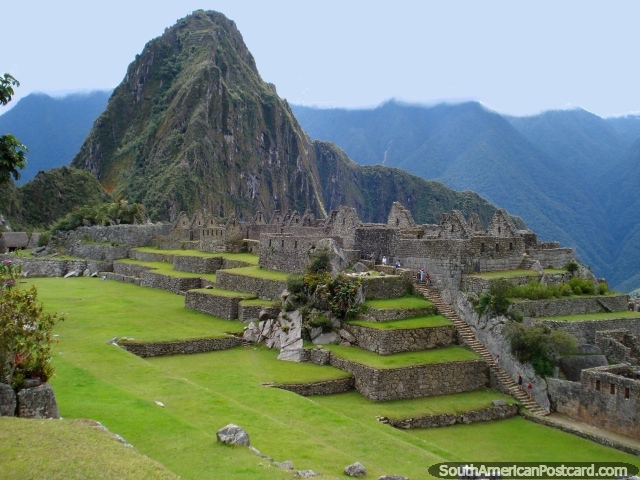 Machu Picchu as it has never been seen. It's a magical experience to explore the Lost City of the Incas! The thing that makes Machu Picchu so special is the setting. about and explain things. When we arrived, from the train station we got on a bus that drove us up to the top of the mountain which took about 20 minutes. Then we waited for a while until they let us walk to the ruins. We explored this amazing place, walking up and around staircases and platforms and rocks and grassy areas. There is enough time also to climb the huge staircase up Wayna Picchu at Machu Picchu for amazing views down at the whole area. It takes less than 2hrs but you will need a strong will to achieve this feat because of the humidity, altitude and steepness. Make sure when you are there, not to lay down under a tree in the shade to rest, otherwise a policeman will come up to you and blow his whistle at you and tell you that you can't do that here. They only allow 400 people at a time to be in the area of the ruins so they like people to move through it. 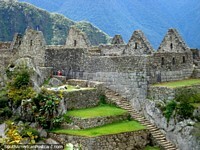 Wayna Picchu, it's possible to climb up the staircase. of Machu Picchu is that it is an interesting place in an amazing setting but the touristyness of it and drama of getting there and the whole thing made it a bit of a drag. I only went there because I thought I had to and because other people told me that I should go. I was glad to get back to Cusco after a day in tourist hell. But in retrospect I am glad to be able to say that I have been here. The Inca Trail from Cusco to Machu Picchu is sometimes booked out for months in advance in peak season or the government may stop issuing permits because of the excessive crowds of tourists. There is an alternative to trekking the Inca Trail which is to trek via Salkantay. The trek is open to everybody, without space limitations. It is located in the same region as that of the Inca Trail and has beautiful scenery of snowcapped mountains and rain forests.